The big band - Alta Cali! "Trio Paz embodies the essence of what is great about live music"
Thanks Tam! So glad you called, we had a great time performing for you and your group! Hiring Daniel Fries was one of the best decisions we made for our wedding. My wife loves Flamenco guitar and after a bit of online research, we found Daniel. He was incredibly prompt and professional in his communication and was able work with our budget. He even sent samples for us to listen to and choose from. 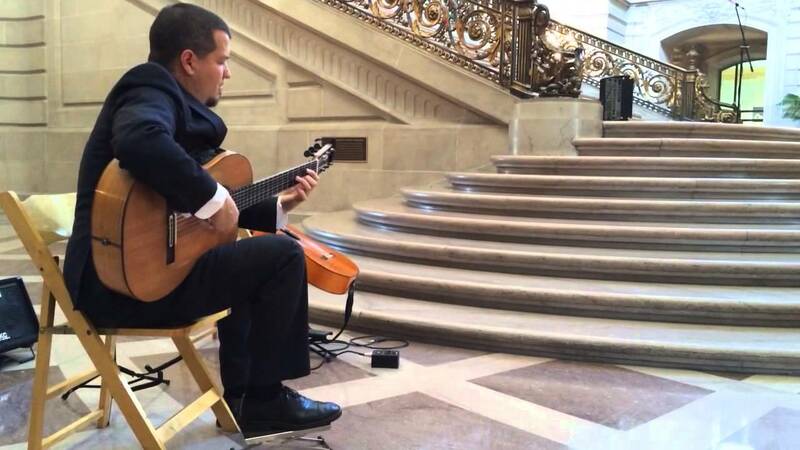 During our ceremony, instead of traditional or DJ music, Daniel played the most beautiful solo guitar music while everyone walked down the aisle. 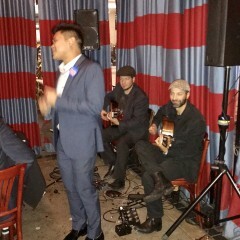 Then during cocktail hour, he was joined by his rhythm guitarist and they played AMAZING flamenco music. 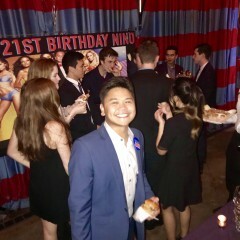 It was so beautiful, etherial, and most importantly, unique - many guests commented on how incredible they were. If you're looking for something memorable to include in your wedding, I would DEFINITELY suggest booking these guys! Daniel and his Trio did a great job. Everyone loved the music. They were happy we let them jam with some more experimental, jazzy stuff and it was just what we wanted! Thanks Damien! We had so much fun playing for your party - it isn't every day we go off script like that - I'm glad you enjoyed it! I highly recommend Daniel Fries and Trio Band. They’re great, easy to work with, very professional and we all had fun. I love everything about them, the music most specially, the crowd loved them and we all had a blast! We are punctual, clean, well-dressed, respectful, volume-conscious, deferential, aware professionals who pride ourselves on customer service first and foremost. 1. Solo Spanish Guitar - flamenco and some classical as well. Perfect for wedding ceremonies, intimate parties, and parties on a budget. 2. 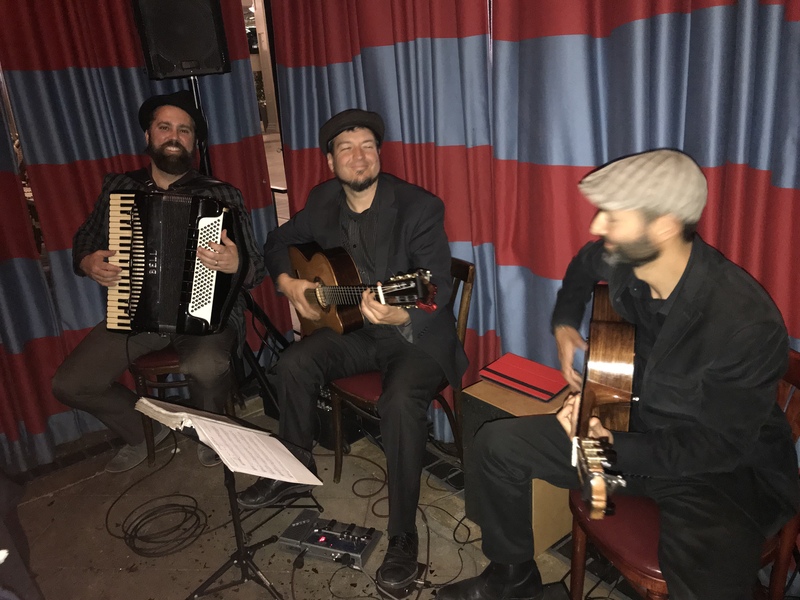 Spanish Guitar Duo - more upbeat, with a mixture of Flamenco Rumba and Latin Ryhthms and songs - great for small cocktail parties! 3. 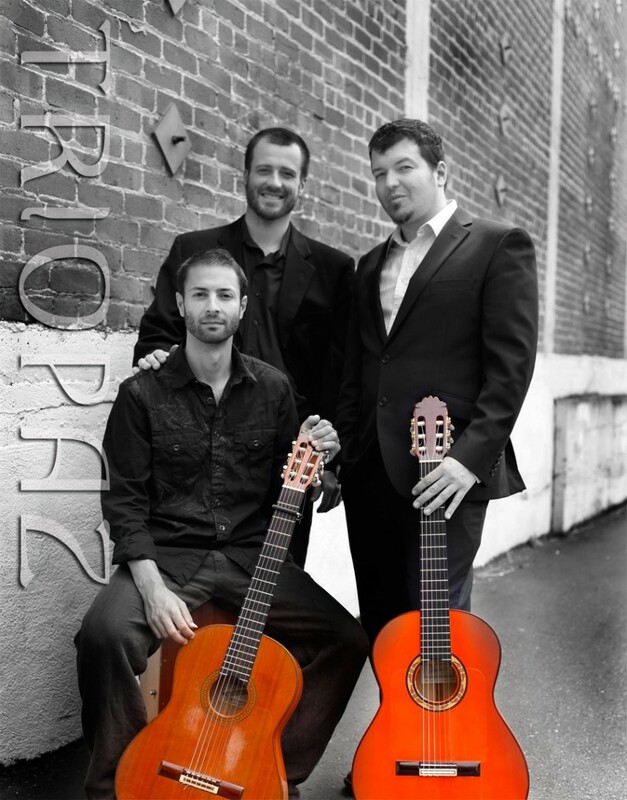 Trio Paz - 2 Spanish guitars plus specialty percussion for more rhythm and excitement - an excellent choice for parties and weddings! 4. Flamenco dance show - typically with guitar, vocals, and 2 dancers, performed in 15-30 minute sets. Exciting choice to make an impression at a party, but not for weddings, as it will overshadow the wedding couple. 5. Build a bigger band - we can add bass, more percussion, vocals, sax/flute, violin to get the sound and vibe you're looking for. 6. Alta California - a unique Bay Area latin band/dance experience - see http://altacali.net for more info. We have had many years of experience playing for everything from cocktails to dinners to after dinner and ceremonies. Every moment in the evening has its particular feeling and set of constraints presented to us as musical mood-setters. For instance, during dinner we never want to get in the way of a diner's experience of the food or quieter conversation, so we play slower, quieter music which can sit in the background and enhance the experience of eating, rather than overwhelm the diner's sensory experience. 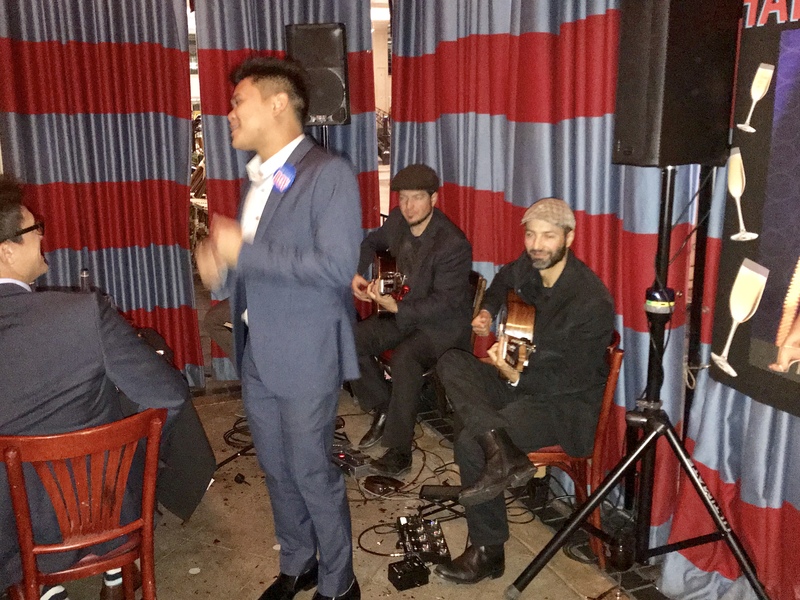 Bossa Nova and Latin Jazz tend to be what we favor during this time, and we choose each song from our repertoire as we go, tailoring each choice to that particular moment of the evening. The main course, for instance, requires that we are even more toned-down in what we play than does the salad. We also pay very careful attention to the facial expressions of your guests, constantly monitoring for signs of either appreciation for the music, or of annoyance, and we adjust what we do accordingly. I should mention here that if you have any guests with hearing aids, you will want to seat them as far from the music as possible, as it will be difficult for them to enjoy themselves, or to participate in conversation with even a low volume of background music or noise. After dinner we watch the crowd and wait for a certain level of digestion to have been achieved, and for the energy of your guests' bodies to move away from their bellies. 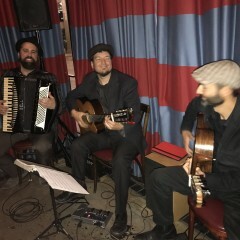 We then know that it is time for us to begin playing our more uptempo numbers, especially flamenco rumbas, setting a mood of easy confidence, and we enjoy watching as guests begin speaking more animatedly, and body language changes to excitement as conversation flows more and more easily. We keep a keen eye on movements which indicate to us that a guests or group of guests may be ready to dance, and if a little musical encouragement is needed, we make sure that we provide that extra energy to make it happen. If guests do indeed choose to dance, we shift gears to enhance the experience of the dancers as much as possible. The tempo of our musical selection becomes critical, and will fall between 125 and 140 beats per minute. We know exactly which songs in our repertoire fall into this category, and have been saving them for this moment. We now think the way a good DJ would think, choosing each song to flow seamlessly into the last and the next, but varying the style and key just enough to keep things interesting, and keep people moving. We will even move directly from the end of one song into the next without stopping the beat, so that the dancers' experience does not diminish even for a second. When the dancers' energy begins to fade, we will play a slow dance to let them recover their energy or appreciate a romantic moment with a loved one, and then, if the mood is right, we will pick the music up again. Of course, if ever a musical selection isn't quite right for a party, the host/ess need only make eye contact and let us know with a brief hand or facial gesture how to adjust what we're doing. We will always defer to the tastes of our client, and your satisfaction is our top priority, so we make it quick, easy, and hassle-free for you to change the mood if one of our musical selections doesn't resonate with your vision for the moment. Regarding cocktails, you mention you'd like more ambient/jazzy music. We are happy to accommodate this. Cocktails are a time for old friends to greet and get reacquainted, and for new relationships to be forged, so supporting the flow of conversation and creating a feeling of confidence and connection are what we prioritize with our musical selections. Changing the feeling of our music by juxtaposing diverse genres and tempos can enhance conversation by keeping it moving. A surprising new musical genre in the background triggers a new thought or memory in a guests' mind, and the conversation gains a new topic, becoming more interesting, and holding together where otherwise it would drift for lack of subject matter. A shift up to double-time has not only this same effect, but gives a feeling that the conversation has become more interesting and exciting - while on the other hand, moving the music out of double time back to a relaxed feel gives conversationalists the feeling of having been on a journey together which has just come to a relaxed and comfortable resting place. 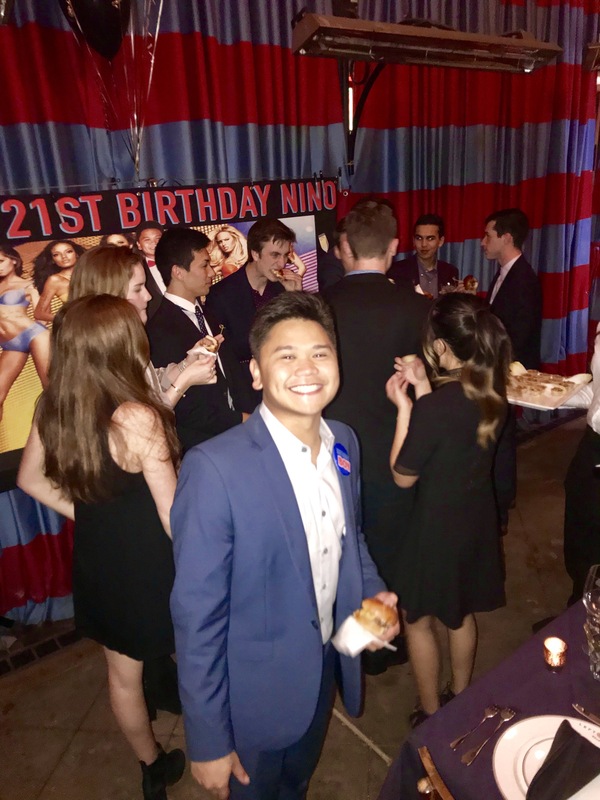 For this reason, we like to keep the music varied during cocktails, and of course we would employ jazzy and ambient feels, but with your permission, we will also mix in more uptempo and diverse music. I know this is a mouthful but I hope it has given you an insight into the real details of our work, and why our years of experience will make a difference to your party's success. Daniel Fríes is one of the premier flamenco guitarists in California, both as an accompanist for flamenco song and dance, and as a soloist. He has performed with many world class and local flamenco artists as La Tania, Andrés Marín, Cristo Cortés, and Manuel Gutierrez, Caminos Flamencos, Carola Zertuche, Arte y Compás, and Carolina Lugo's Brisas de España, for which he has been musical director. While in Italy, he performed with two of the country's top dancers, Juana Cala, and Maria Jose Soto Leon in venues from Venice to Milan to Sicily. 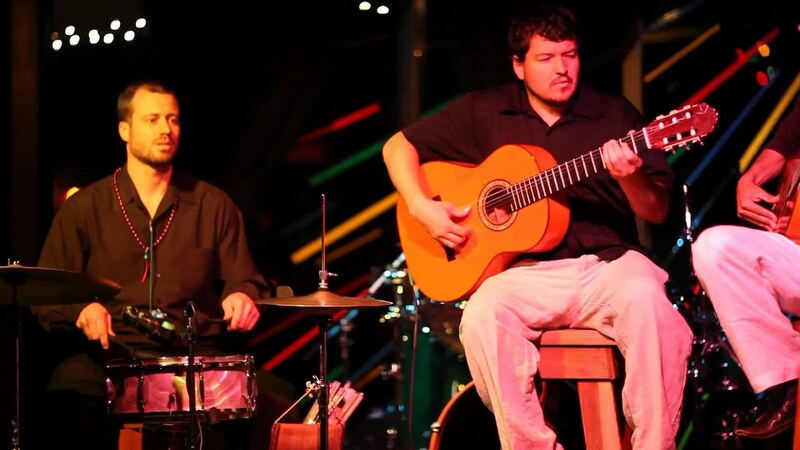 While his playing style remains grounded in the roots of the traditional Spanish flamenco, he also explores new directions in musical composition as well as blending of elements from the various musical traditions around which he grew up in San Francisco; Indian, Middle Eastern, Latin American, and African. He has performed in venues ranging from San Francisco's Palace of Fine Arts and Yerba Buena Center for the Arts, to venues in China and in India. He also directed the music for "Zambra Bailar," a company mixing flamenco with Middle Eastern music and belly dance. In 2002, he composed and directed the music for La Tania's ongoing project, "The Passage of The Muse." In 2003, Mr. Fríes took his band Funkiri to Sevilla, Spain. More recently, he has pursued collaborations with a wider range of musicians, including the outstanding persian singer Hamed Nikpay, with whom he produced Mr. Nikpay's 2008 release and subsequent tour "All is Calm." Mr. Fríes has studied in Spain with several flamenco guitar masters, including Manolo Sanlucar, Paco Peña, and Jose Luis Rodriguez. He has also studied Indian Classical music under Ustad Ali Akbar Khan, and Ghanain drumming with C.K. Ladezkpo, and has B.A. in Music from U.C. Berkeley. Jean-Paul Buongiorno was born on September 25th, 1975 into an Italian-French family. His musical training began with classical piano at an early age. He later taught himself electric guitar in high school by listening to the blues guitar playing of B.B King, Muddy Waters, Stevie Ray Vaughn, Jimi Hendrix and many others. Later, while attending Art School at the University of Wisconsin-Madison, he became influenced by Jazz, Brazilian, and world musicians such as Django Reinhardt, Wes Montgomery, Paco de Lucia,Tom Jobim, Baden Powell, Joao Gilberto, Gilberto Gil, Caetano Veloso, Bob Marley, and many more. Jean-Paul’s passion for music has led him through many genres including; blues, funk, reggae, Cuban, Brazilian, and flamenco all of which are reflected in his unique personal style of playing as well as in his compositions. He has lived and performed in Brazil, Spain and the U.S absorbing the music of each country. Jean-paul has studied with jazz guitarist Mimi fox, flamenco guitarists Daniel Fries and Juan del Gastor, Brazilian guitarist Paolo Bellinati, and many others. Jean-paul currently lives in Berkeley California where he continues to perform, compose and teach. Surya Prakasha is noted for his steady time and feel, clear phrasing and taste, sensitive touch and dynamics, flexibility and supporting ability, intensity and emotional fire. A versatile drummer, Surya has experience playing a diverse range of music styles. Surya graduated with a Bachelor of Music from the Oberlin Conservatory(link) in 1999, where he apprenticed with jazz drummers Greg Bandy, Michael Carvin, Joe Morello, and Dennis Mackrel. He studied intensive music theory, history, performance, composition and arranging with composer and educator Dr. Wendell Logan. Surya studied African diaspora drumming with percussionist Adetobi Greg Jackson and dancer Adenike Miriam Sharpley from 1994-1999 and performed with both. He studied classical snare drum withMichael Rosen and performed with the award-winning Oberlin Jazz Septet and Ensemble. Trumpeters Clark Terry, Mike Mossman, Marcus Belgrave, Matt Schulman, and Greg Glassman; Bassists Jamil Nasser, Lamar Gaines, and John Evans; Pianists Harold Mabern, Muhal Richard Abrams, Neal Creque, and Dave Matthews; Saxophonists James Moody and Donald Walden; Flautist James Newton; Guitarists Bobby Ferrazza, John Schott, and Shelley Doty; and Vocalists Jane Monheit, Vanessa Rubin, Jacqui Naylor, Spencer Day and Pyeng Threadgill. Ideally you should provide AC power to our location for our PA system, but we can also bring battery-powered amplifiers on request. We prefer to be fed if the event is to take place during a meal, but don't require this. In any case we'd like to know in advance. Like any service people, we perform best when we are provided with an appropriate level of hospitality. Depending on your choice of musicians, this will vary. Please inquire once we are booked.